Another look from Carmel, I wore this outfit to lunch at The Forge and then on to explore the views via the 17-Mile Drive. 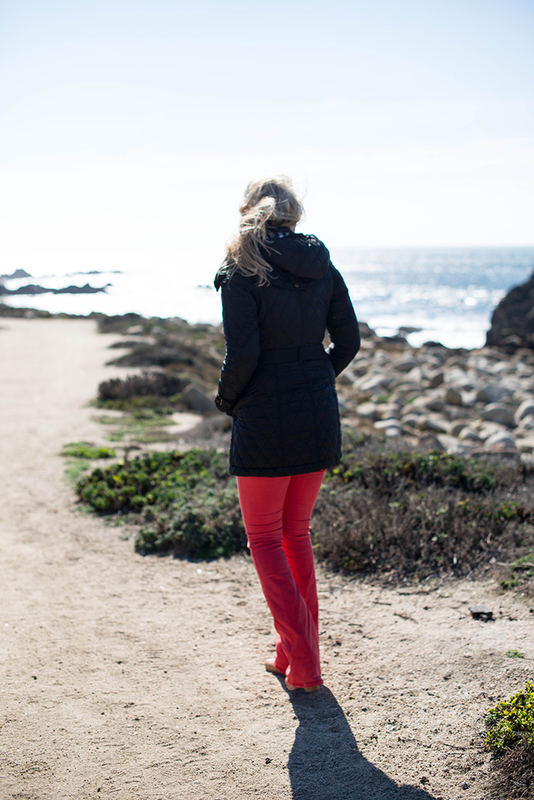 That day ended up being super windy, so bringing along a good jacket was a necessity – this one by Burberry is a great piece for any trip to the Northern California coast. It’s not heavy like a coat would be, but it keeps you warm from the wind and somewhat chilly temps. Now as far as the rest of my look goes I definitely didn’t buy these pieces to wear together, but they’re kind of a perfect match, right? I bought this Equipment shirt last year on sale, and these colorful Rag & Bone jeans I’ve had since I lived in Houston several years ago. I’d been wanting to try a monochromatic look, so it was fun that I already had pieces that worked to create one! This spring/summer, I want to create another one-color look with all the pale blue pieces I’ve picked up. well done, and I love how these red jeans look slightly faded. absolutely love the monochromatic look! Not an easy look to pull off, and you nailed it. Perfectly. I love it! I love this color red on you! Stunning! 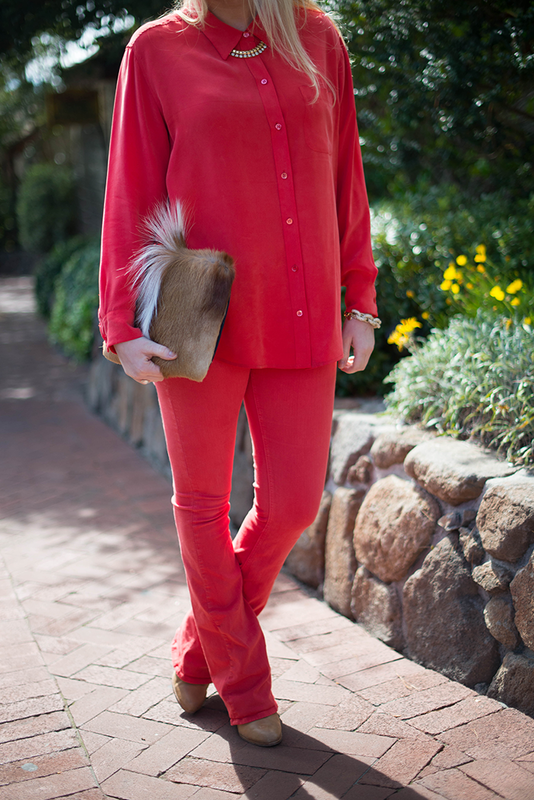 you and I both had red in mind today I think – great minds think alike! :) such an amazing color, and I love how you you were brave enough to do it head to toe! love this look. Love the red and that is such a cool clutch!! Merritt I love this!! The cut and color of those jeans is great! Love the clutch and the shades! Such a pretty backdrop for pictures. those earrings are so pretty and unique! You look fantastic in red! Your sunglasses are honestly to die for. What a cute look! I likey. I really like the jeans. I LOVE it! I love when people break all the rules, because honestly as long as you wear something with confidence and a smile, it always works. Well, 99% of the time. 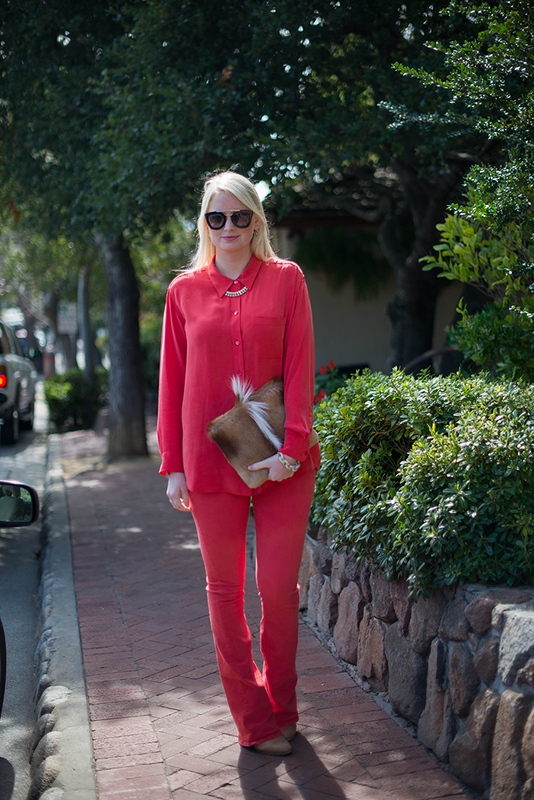 Red is one of my favorite colors so I absolutely love this monochromatic look! And that clutch is too fab! Red is your color! Beautiful shots! !